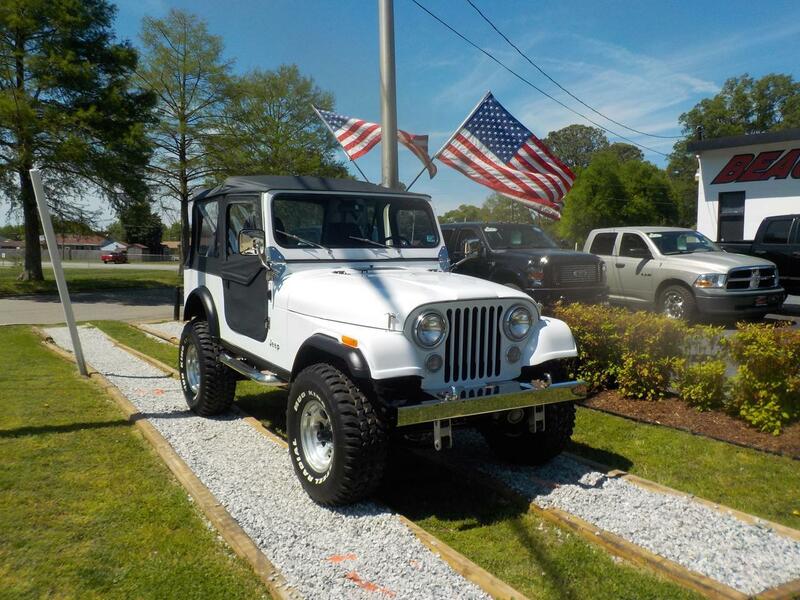 1983 JEEP CJ CJ-7, ORIGINAL 6CYL ENGINE, MANUAL, FANTASTIC CONDITION, GREAT COLLECTORS PIECE,VERY RARE! 2015 DODGE CHALLENGER SXT, WARRANTY, BACKUP CAMERA, PARKING SENSORS, REMOTE START, UCONNECT, REAR SPOILER! 2004 CHEVROLET TAHOE Z-71 4X4, WHOLESALE TO THE PUBLIC, GET IT BEFORE IT GOES TO AUCTION, DVD PLAYER, CAPTAINS CHAIRS! 2001 JEEP Cherokee SPORT 4X4, WHOLESALE TO THE PUBLIC,GET IT BEFORE IT GOES TO AUCTION, RUNS AND DRIVES! 2010 CHEVROLET TAHOE 1500 LT 4X4, WARRANTY, LIFTED, LEATHER, PARKING SENSORS, RUNNING BOARDS, TOW PKG, 3RD ROW! 2013 FORD EXPEDITION EL KING RANCH 4X4, WARRANTY, LEATHER, DVD PLAYER, HEATED/COOLED SEATS, SUNROOF, 3RD ROW, TOW PKG! 2012 TOYOTA TACOMA TRD OFF ROAD DOUBLE CAB 4X4, WARRANTY, LIFTED, BRUSH GUARD, BACKUP CAM, PARKING SENSORS, 1 OWNER! 2013 TOYOTA COROLLA LE, WARRANTY, KEYLESS ENTRY, A/C, CRUISE CONTROL, AUX PORT, 1 LOCAL OWNER! 2013 LINCOLN MKZ ECOBOOST, WARRANTY, LEATHER, NAV, HEATED/COOLED SEATS, REMOTE START, PANORAMIC SUNROOF, BACKUP CAM! 2011 KIA SORENTO LX WHOLESALE TO THE PUBLIC, GET IT BEFORE IT GOES TO AUCTION, HEATED SEATS, BACKUP CAM! 1999 TOYOTA TACOMA PRERUNNER, WHOLESALE TO THE PUBLIC, GET IT BEFORE IT GOES TO AUCTION, LONG BED, A/C! 2011 BMW 750I XDRIVE, WARRANTY, LEATHER, SUNROOF, NAV, HEATED/COOLED SEATS, BACKUP CAM, ONLY 59K MILES! 2011 TOYOTA TACOMA TRD SPORT DOUBLE CAB 4X4, WARRANTY, BACKUP CAM, 1 OWNER TRUCK ONLY 32K ORIGINAL MILES!!!! 2012 DODGE RAM 1500 SPORT CREW CAB 4X4, WARRANTY, LEATHER, BACKUP CAM,HEATED SEATS, 1 OWNER, LOW MILES! 2012 MAZDA 3 S GRAND TOURING, WARRANTY, MANUAL, LEATHER, SUNROOF, HEATED SEATS, KEYLESS START, PARKING SENSORS! 2010 HONDA ACCORD LX, WARRANTY, KEYLESS ENTRY, CRUISE CONTROL, A/C, AUX PORT, THEFT RECOVERY, AVID RIMS! 2010 DODGE CHALLENGER SE, WARRANTY, LEATHER, SIRIUS RADIO, UCONNECT, CRUISE CONTROL, A/C, SUNROOF, ONLY 65K MILES! 2012 VOLKSWAGEN PASSAT SE, WARRANTY, LEATHER, SUNROOF, HEATED SEATS, NAV, BLUETOOTH, AUX PORT, POWER DRIVERS SEAT! 2013 HYUNDAI GENESIS R-SPEC COUPE, WARRANTY, MANUAL, SATELLITE RADIO, UCONNECT, CRUISE CONTROL, KEYLESS ENTRY! 2007 DODGE RAM 2500 HEAVY DUTY SLT MEGA CAB 4X4, WARRANTY,CUMMINS DIESEL, BRUSH GUARD, RUNNING BOARDS, TOW PKG!